"They've got to leave happy. And I'll do whatever it takes to make them happy." Mark Snowden isn't exaggerating. The Feige's Fine Dining owner and chef goes to great pains every night to ensure that his patrons are satisfied to the fullest extent by the time they leave the restaurant's comfortable atmosphere. Needless to say, patrons typically end their Feige's experience with a full stomach coupled with full satisfaction. Ever since it's grand opening five years ago, Feige's has become the unofficial flagship for casual fine dining in North Perth and beyond. Mr. Snowden and wife Monica Filman's recipe for success could not be simpler: be good to the customers and they will return the favour tenfold. "Listowel has supported us since the day we opened," said Mr. Snowden, seated at one of the tables that will be filled with customers by the dinner hour. "Maintaining a consistent level is the hardest thing to do in the business." The couple has no doubt achieved that. Since opening its doors in 2002, Feige's has had and averge of 5,000 patrons per year, for a lifetime total of roughly 25,000 - a true testament to the couple's passionate customer service approach. The entrepreneurs have a combined total of 48 years in the hospitality sector. The former owners of MoDean's Roadhouse, Mr. Snowden and Ms.Filman ran both the bar and Feige's for four years, before overwork and exhaustion began to take its eventual toll. They both decided that Feige's was the ticket to stick with, a decision that has paid dividends. Feige's was recently ranked 81st (with a perfect ten rating) out of the top dining locations in Ontario by restaurantica.com, a popular online restaurant review site. But Mr. Snowden lets his food preparation do the talking for him. Feige's offers seven main entrees, prepared exactly to the patron's specifications. Three to five specials are also offered on any given night. 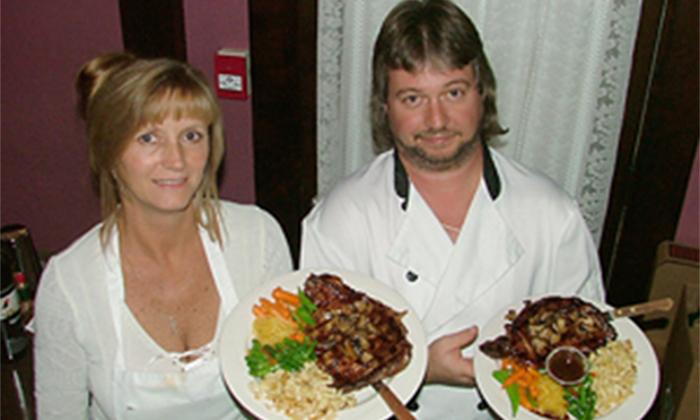 Feige's prime rib steak, seafood dishes, and homemade soups are its current bestsellers, with Mr. Snowden heavily influenced by the Old French style of food preparation. Ms. Filman is also stealing a bit of the spotlight from her chef husband, as she has people talking about her delicious homemade soups, and salad dressing, including the popular German Caesar and Gourmet Oil and Vinegar and raspberry concoctions that are available at the Kitchen Cupboard and Icebox in Listowel. Some of these recipes were handed down to Ms. Filman from her father who was a master chef in Germany during the last half-century. These salad dressing became and instant seller this year, only adding to Feige's already sterling reputation. "I'm a perfectionist," commented Ms. Filman. "Everything has to be done perfectly. I think that speaks enough in itself." Feige's seats about 40 customers, plus the added space the new upstairs boardroom has provided. It has a fully stocked bar, filled with spirits and fine wines including Feige's own label, fermented on Ontario's famous Pelee Island. Mr. Snowden said that $35 - $50 per patron is more than adequate to provide them with food, drink and dessert, eliminating the myth that a fine dining experience is only available for the financially well-off. Mr. Snowden also ensures full satisfaction amongst his customers by personally visiting with each one during their experience. The chef also goes to great lengths to present his dishes in the best possible fashion, as according the him, the way a meal looks also attributes greatly to its taste. "The thing you eat with first in a restaurant is your eyes," he said. "If it looks good, it will taste good." The Feige's setting also looks as good as the food itself. Ms. Filman takes care of the decorating aspect of Feige's, combining a series of dark colours with antiques and floral arrangements to make it one unique dining experience that patrons won't soon forget. "Monica is definately the driving force behind Feige's," Mr. Snowden said of his wife. "Everything we do stems from her." Mr. Snowden and Ms. Filman assured that they didn't launch Feige's Fine Dining in the first place for financial gain. They did it for the love of food, and for the love of serving a public that has been so good to them throughout their time as one of the premier restaurants in the province. "I just love cooking for people," said Mr. Snowden. "There's no more joy in what you do than hearing people on the floor telling you that they enjoy what they're eating. There's no greater satisfaction." In 2012 we closed Feige's Fine Dining due to the increased popularity of our salad dressing. Restaurant patrons loved our dressing and were interested in purchasing our product to take home. We started bottling our products for our customers. We then introduced our Feige's Gourmet Honey Mustard and Poppyseed Dressing. The demand steadily increased until we could no longer run both the restaurant and the salad dressing. Our dressings are now sold at many retail outlets. A list of the many fine retailers can be found on our "links" page. We recently introduced our newest product, Feige's Artichoke Spread, which was originally served as our "house appetizer" at the restaurant. Feige's Gourmet Dressings are not just salad dressing. They are extremely versatile and can be used for dips, marinades and grilled vegetables. You will find many uses for our products on our "recipes page"
"DON'T EAT NAKED VEGETABLES, AWAYS KEEP THEM DRESSED"